Do you have a painting project on the horizon. Columbia Paint can help! 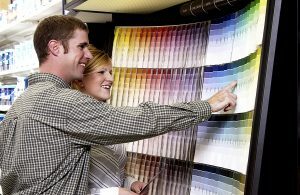 One of the most important factors in interior design is the story you tell through color. Painting options seem endless, especially when you’re in the middle of a renovation project. Keeping up with the trends can help you make decisions. It not only makes your home look contemporary, but it helps narrow down your choices. Don’t be afraid to utilize the boldness of black in your design. It has recently made a comeback and finds a home in bedrooms, bathrooms, and even kitchens. While some people prefer to use it with small accents, other designs feature its boldness on a feature wall. Using black goes a long way toward setting the tone in the room. A great tip is to pair black with natural wood to create balance. Hues in the berry family are a popular trend; they bring richness and vibrant cheer into a space. The berry hue family ranges from strawberry red to raspberry pink to blueberry. These are statement colors that either go in a bolder direction or softer tone. For a touch of sophistication, many designers are suggesting moving in a blue-green direction. These tones add calmness and peace to a room. They are also a great choice for beach-themed rooms, especially when paired with organic accents. This trend also helps highlight minimalist designs by allowing more light into the space. The gray color palette is one that will always be trendy. It’s one of the most useful platforms on which to design and can either be used to create cool energy or tranquility. Bluish gray is the direction you’d head to create a tranquil space, like in a bedroom or home office. Deeper tones of gray have their own unique charm and are a great complement to mid-century and contemporary designs. Try out the boldness and brightness of yellow. Yellow is a trending color because of its ability to uplift the atmosphere with strength and adventure. Completely saturate the space with color by pairing it with another bold and deep hue or add a touch of softness by pairing with white or natural accents.